As if the gluttony of last week's Christmas dinners wasn't enough we decided it would be a marvelous idea to head down to the Peking Duck House, surround ourselves with European tourists, and indulge in a coma-inducing meal of pork dumplings, fried scallion pancakes and the pièce de résistance, a whole Peking Duck. It was an effort to move afterwards, much less motivate to work on this quiet and sunny winter afternoon. Love PDH! My only wish is that they had thinner "crepes." 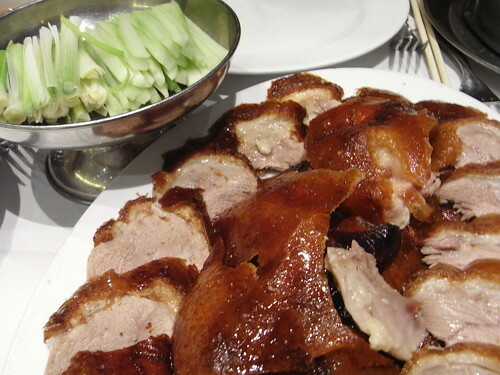 I think currently they present their Peking Duck with straight up white tortilla rounds. I find them a little too thick and mealy as a wrapper. But love that duck!